Long gone are the days when the only casino game that included a jackpot was slots. 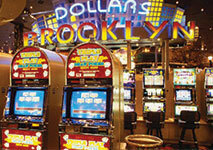 With the advent of the many state-of-the-art technologies, the casinos have improved their gambling business greatly. They managed to expand their portfolio and offer even more exciting games. Progressive video poker games were among the innovative games which emerged as a result. Thanks to them, you have the chance to win big and enjoy video poker like never before. These games have proven to be extremely exciting and challenging and they will undoubtedly enhance your gaming experience greatly. It is also possible to play them online and win big while sitting at the comfort of your own home. In general, progressive jackpot games are the ones that feature a jackpot which increases every time someone plays. A small part of every bet that players place on these games goes straight to the prize pool. This is the reason why these games usually offer a substantial amount of money as a final prize. When it comes to progressive video poker games, the principle on which they operate is simple – all of the machines that contribute to the jackpot are connected. This means that every time you play on such a machine and you insert a coin, the amount of the jackpot grows. Most progressive video poker games have no limit in regards to the amount that they can accumulate. You can play many different versions of video poker which offer a progressive jackpot. One of the most widespread games is 8/5 Jacks or Better as it is considered to be the classic video poker game. Its winning combinations and pay table are identical to the standard game, the only difference is that if you are lucky enough to collect a Royal Flush, you will win big. Sometimes it is not even necessary to get a Royal Flush as some variations offer a jackpot for even lower winning combinations such as a Straight Flush. Once a player wins the progressive jackpot, its amount is automatically reset to its initial starting position. Even though the rules of the progressive video poker games are the same as in the standard game, it is essential to take your time to get familiar with their subtleties. Also, you should bear in mind that there are many casinos that take advantage of the fact that these games attract a number of players because they feature enticing jackpots. As a result, some video poker variations have additional requirements which you should meet in order to be rewarded with a substantial amount. For instance, in some versions collecting a Royal Flush is not enough to qualify for the jackpot as in them, you are also required to get this winning combination at the beginning of the game. If you form a Royal Flush after the initial dealing of the cards, you will get only the standard payout. This is the reason why you should always take into account the terms and conditions that every machine has beforehand. Another thing that you should consider regarding progressive video poker games is the fact that in order to be able to compete for the huge jackpot, you are required to place the maximum number of coins every time. Most video poker machines accept up to five coins which you can insert for every hand. Should you decide to play a progressive version, always remember to place a five-coin bet as otherwise your wager will contribute to the ever-increasing amount of the jackpot but you won’t be able to win it. If you opt for this type of games, it is best to apply a more risky approach and bet the maximum number of coins because if you are lucky enough to get a Royal Flush, you will be able to win the full life-changing amount of the progressive jackpot. 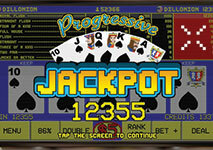 As previously indicated, nowadays it is possible to play various video poker games which feature a progressive jackpot. Even though they differ from one another because of their pay tables and winning combinations, they have one thing in common – they give you the unique opportunity to win big. Apart from the standard Jacks or Better game, you can also play many other exciting progressive video poker variations. Some of them are just as popular as the classic game, if not more so. You can enjoy progressive video poker variations in a number of brick and mortar casinos as well as online. Some of the most popular such games include Jackpot Deuces, SupaJax and others. SupaJax is a progressive video poker game which is developed by the prominent software supplier Microgaming. The rules of this version are the same as in the standard game, meaning that the highest winning combination that you can form remains Royal Flush. If you manage to collect it by placing a five-coin bet, you will be rewarded with 3000 coins. The major thing that sets this variation apart from the rest of the video poker games is the fact that it gives you the chance to win a progressive jackpot. In order to do so, you need to collect four jacks and one extra card – SupaJax. It should be noted that this unique card is not a wild card which can be used to form other winning combinations. Its only purpose is to help you win the progressive jackpot. Also, the general rule for this type of progressive games applies here as well – in order to qualify for the jackpot, you are required to insert the maximum number of coins. Jackpot Deuces is another progressive video poker game for which Microgaming takes credit. Unlike SupaJax, this version features wild cards which makes it very attractive for a number of players. In this variation, the highest winning combination is Diamond Royal Flush thanks to which you can win big, providing that you place a five-coin bet. If you form this combination, however you have placed only a four-coin bet, you will win only 1200 coins, instead of the substantial amount the progressive jackpot has reached at that point. This is the reason why whenever you play a progressive video poker game, it is always a good idea to put the maximum number of coins. Another thing which makes this version so widespread is the fact that it offers a bonus round called Double or Nothing. Thanks it, you have the chance to double your winnings and increase your overall profit even more. This game is undoubtedly worthwhile due to the fact that it gives you various ways of winning. If the idea of winning a substantial amount of money while having fun appeals to you, then you should definitely try some of the progressive video poker games. This type of games gives you the chance to compete for a jackpot which increases with each bet players place. Nowadays, you can enjoy a number of progressive video poker games which offer you different rules and features. These games can be a great source of entertainment, however always remember to get familiar with their rules beforehand.